One For All Smart Control Motion review | What Hi-Fi? The more devices you accumulate on your kit rack, the more remote controls inevitably clutter up your room. The cure is an all-in-one remote. These are nothing new, but they’ve tended to be relatively expensive, difficult to set up, unwieldy, or all of the above. One For All aims to untick all of those boxes with its Smart Control Motion, which you can wave about to perform basic control functions. Backlit and pleasantly weighty, it’s easy to configure, too. It can handle macros (to turn all your kit on at once and then switch to Blu-ray mode, say), and the gestures work well (wave it left to rewind, right to fast-forward, down to pause and up to play) for devices including disc players and PVRs. 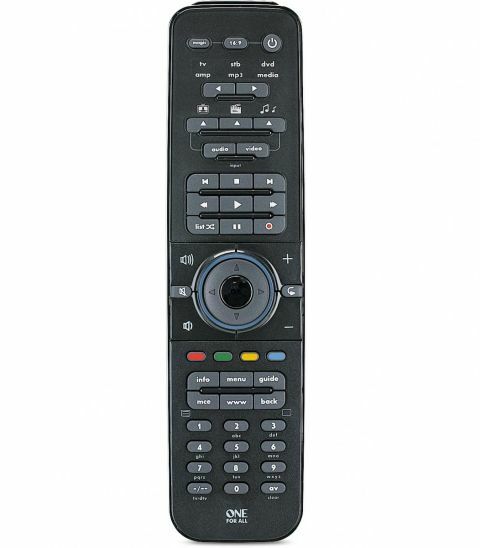 You can also assign specific commands from complex AV amp remotes to custom buttons, should you wish to. If remote clutter is the bane of your life, you could do a lot worse than fork out £30 for one of these.